The creators of the blockbuster podcast The Adventure Zone bring their talents to Marvel for a wild romp through THE WAR OF THE REALMS! Earth is at war, besieged by an army of Frost Giants, Trolls and Fire Goblins - and the mighty Thor is nowhere to be found! But could it be that the key to turning the tide is…Thor's baby sister? 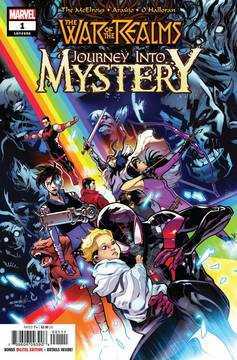 Journey into Mystery with Spider-Man (Miles Morales), Hawkeye (Kate Bishop), Wonder Man, and Balder the Brave as they go on an epic quest to save Earth's only hope! (And, yes, deal with diaper duty.) Rated T+.